Last week, the City of Yorba Linda finalized design and names for their new Yorba Linda Public Library, Yorba Linda Cultural Arts Center, and the Virginia DeLand Theatre – a 3,200 square foot black box performance space within the Arts Center. The space was designed to maximize flexibility of the space for various kinds of events, from theater and dance to live music, film festivals, and banquets. 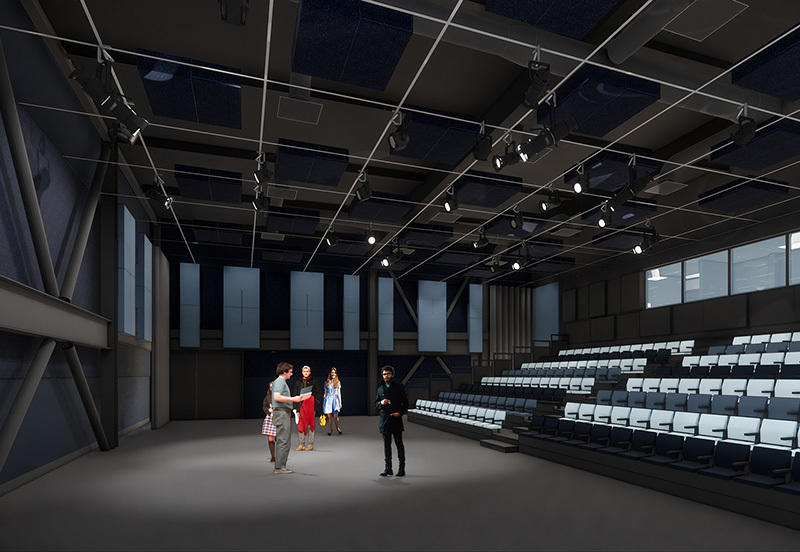 The 250 seat room includes retractable seating to accommodate one-sided proscenium layout and space enough for three-sided (thrust) or four-sided (in-the-round) performance seating. The walls will be sparsely adorned – painted deep blue and black, with exposed structure, suspended acoustical paneling, and retractable curtains. 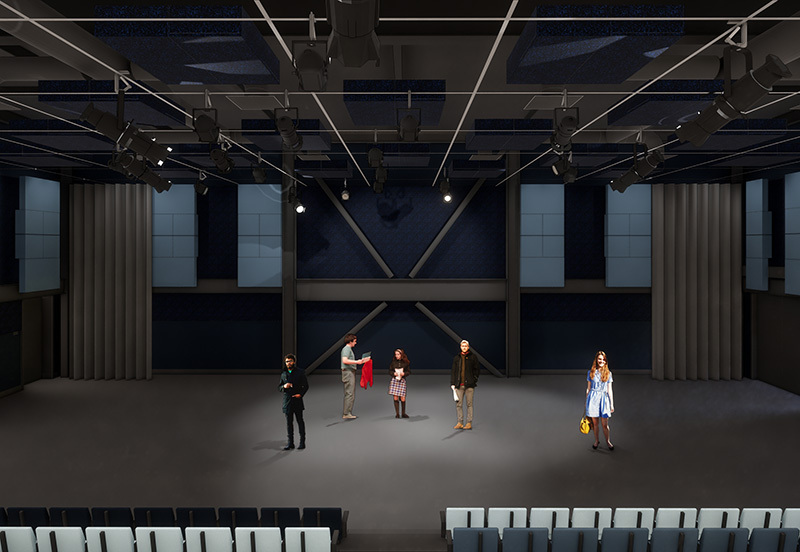 A robust control room, green room, and ample, accessible storage are also musts for flexible usability of a black box theater – and the sprung floor will be appreciated by performers. The vocabulary of the rest of the Library and Cultural Arts Center campus – stately “colonnades” (expressed on the exterior by two-story bands of windows and stone cladding) are echoed in the suspended acoustical “banners.” The theater’s qualities will be noticeable to those arriving through the acoustically “live” Arts Center gallery into this absorptive theater space – where you can sense that a performance is about to begin. The DeLand Theatre was named for Virginia DeLand, a long time Yorba Linda resident and founder of the Yorba Linda Civic Light Opera. Leading the company for 16 years, DeLand produced over 50 shows, and promoted family friendly entertainment and youth programming. 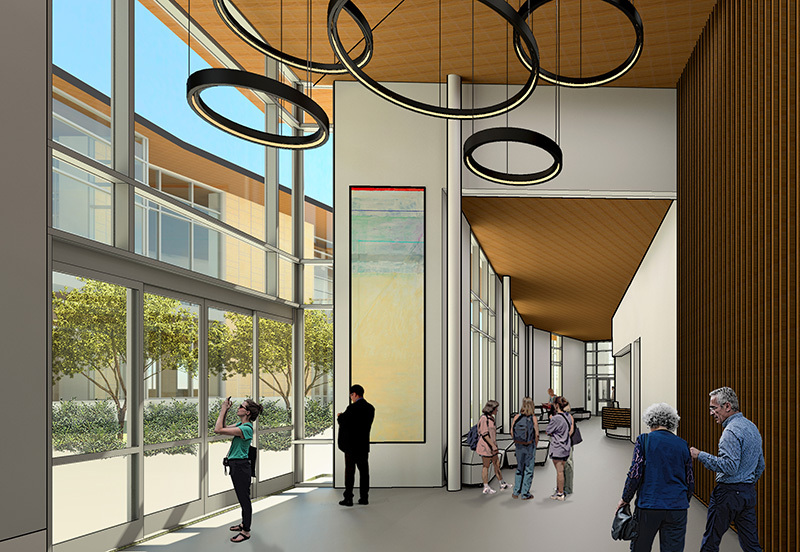 The Yorba Linda Library and Cultural Arts Center campus project is now out to bid, with an expected completion date of May 2020.